As anyone who has ever watched The Blair Witch Project knows, exploring creepy, supposedly empty houses in the woods is rarely a good idea. This movie logic holds especially true if you are a group of young people armed with cameras. However, there are some people on this spooky old earth willing to take the risk. 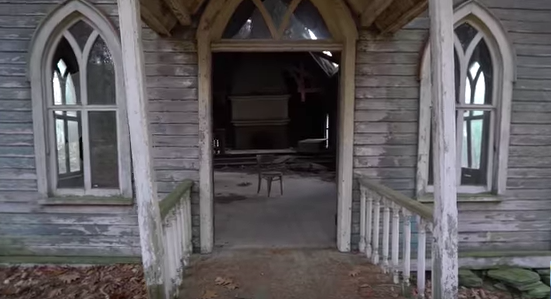 YouTuber Josh and his adventurous pals ventured way off the beaten track; taking a look at a rotting chapel and two long abandoned houses deep in a forested area. The gang likened the chapel to something out of a fairytale, gothic windows framing the lonely woodland surroundings on all sides. Mass clearly hadn’t been said within those walls for a long time; decay warping the floorboards where the congregation had once knelt in prayer. The leaf-strewn path leading up to the first home clearly hadn’t been trodden for some time, but echoes of the past still remained. A collapsed piano crumbled silently into the festering floorboards while mouldering sofas were arranged around what must have once been an inviting fireside. What I like about doing abandoned houses is that they’re way more personal than going to a public school or a hospital. Because this is like someone’s home. And god knows what happened to them for this all to happen. Whoever built this first must have been so happy, with a family, you know, and now look at it. You’ll never know what happened too because it’s not like a big place that gets recognition. The second home the explorers visited was much more intact and yet even more unsettling than the first, containing the dusty remnants of a life mysteriously interrupted. A film of dust enveloped the faded VHS collection while pastel shaded, miniature chairs bore the names of the children who had once sat in them. The uncanny mix of normality and weirdness was jarring. Mugs had been left on the kitchen counter while a newspaper dating back to 2008 lay neatly on the dining room table. This is weird actually. This is like me living here and just having to leave, like why? Why would they leave everything? It’s so weird though. It was here where the most eerie discovery of the day was made: a child’s drawing of a long haired woman hanging from a rope by her neck. Now, to find such a drawing anywhere would be enough to send a shudder down anyone’s spine. However, this was clearly no ordinary place. This is actually messed up. 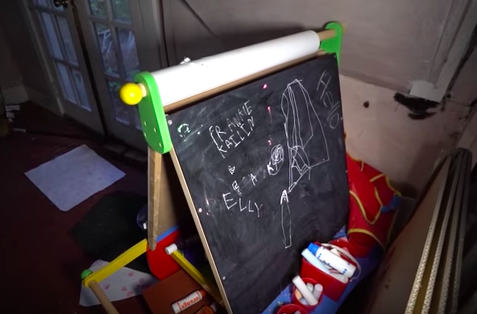 I think another explorer drew it in the past who was trying to scare others If they found the house. I found NO history on that house, to be honest, I don’t even know where the house is anymore. I think I was somewhere in Pennsylvania. I was about a good mile into the woods/mountains for sure! I think the fact that the power was still on and everything there was like it was frozen in time made it really creepy. They still had VHS movies there, which brings a creepier feeling – they don’t even make those anymore! I feel maybe something bad caused this. Or it was haunted! We felt fine because we explore and deal with this stuff daily [laughs]. It’s sorta kinda old to us seeing all this stuff a lot. But I do admit and you can tell in the video we were freaked out and we were talking about this for a few days after! 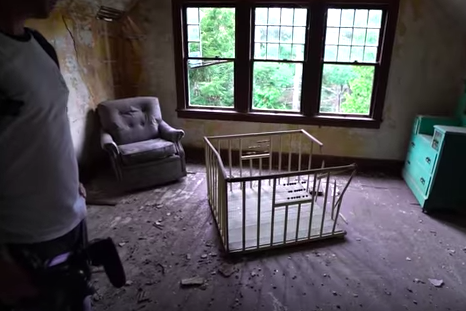 Watch the entire footage for yourself on the Exploring With Josh YouTube page.